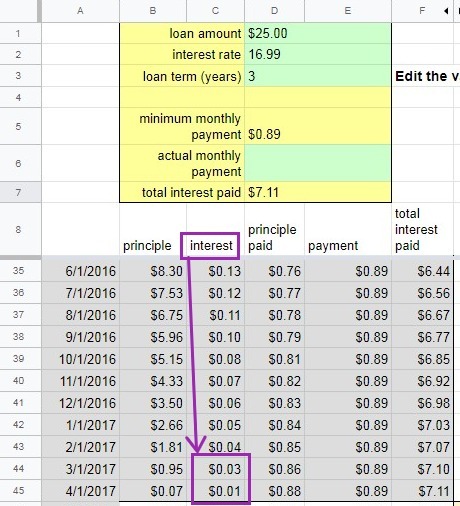 i'm still confused how to even calculate this... say i lent $25 at 5% and a borrower started repaying in jan 2018. at this point i've collected about 8.99, of which 7.92 was principal and 1.07 was interest. i assume my tax form is going to have a box (summing up all my notes) and stating i owe taxes on 1.07? Yes, you got it pretty much right. Interest is ordinary income. Sale and default are capital gain/loss. LC sends you a form 1099. You copy the numbers to your tax forms. You don't need to itemize every loan. LC has tax guides for several years. At the bottom of this post it also mentioned they have an option that works with with Turbo Tax. If you use TurboTax to work out your tax returns, you can have LendingClub tax forms automatically imported into TurboTax and it's done. No manual number entry required. that is quite nice, if it actually accounts for all of this stuff correctly! so we're all kind of incented to sell the last 1 or 2 loan payments? No. Its a little more complex than that. Of the $19.60 you received, some of that is interest, and interest is taxed at the ordinary income rate. The rest of it is return of capital, and is not taxed. It does however change your tax basis. The amount of capital gain tax you owe depends on your tax basis at the time you sold for $1. The LC 1099s are available now. I suggest you just grab yours and you can see the numbers there. After a bit you will understand. Then just copy the numbers to your tax return. well, what if i buy yours, and you buy mine? there are people selling loans with 1-2 payments left with ytm of 5%, i assume someone still buys those and is able to make 5% picking up pennies, right? does LC do that all correctly? if interest is ordinary income no matter what, then the only way i have a capital gain to pay tax on is if i actually successfully sell my note at a premium right? no 1099 for me, i just started investing! does LC do that all correctly? if interest is ordinary income no matter what, then the only way i have a capital gain to pay tax on is if i actually successfully sell my note at a premium right? That's close. You use the word "premium" which is usually used to mean difference between selling price and the principal on the note. That's not quite right. In this case what is important is the difference between your selling price and your tax basis. Tax basis starts at what you paid, and as principal payments are paid to you, your tax basis is reduced. If you sell at more than your tax basis, then you have some capital gains which are taxed. If you sell at less than your tax basis, you have a capital loss, which may reduce your tax. I can't explain the whole US tax system to you in forum messages. I suggest you read up on taxation of bonds in the IRS booklets, which are all available online. At the Lendingclub web site, if you go to the "tax forms" tab on the "statements" page there is a link to "download the 2018 tax form guide". I suggest you download a copy and try to follow it. This guide has several sections. The LAST section describes taxation of folio transactions. It isn't a complete explanation, but does tell you what goes where. Purchase price of Note less principal repaid, plus accrued interest sold and less accrued interest purchased (through Folio Investing). Note: This is the cost basis that is reported to the IRS. You need to wrap your head around that sentence. Sale proceeds minus tax basis is call capital gains, and is taxed at the capital gains rate. thanks for all the info. sounds like the real way to escape taxes is via a roth ira.